At the end of last month, we blogged about getting our hands on a test Blackboard SaaS environment. This month we’ve started the process of testing the environment and finding out the differences and similarities between SaaS and our current version of Blackboard. A lot of the work this month is being done by our Blackboard Project Manager in Amsterdam. Blackboard have taken a full copy of our local version and are importing it into the new SaaS system. Once this is done, we’ll be able to have a look at our existing courses, check that the migration process has worked and that everything is behaving as expected. This will mean looking at existing content, testing all the tools work properly, and running through all the normal daily processes we use. In the meantime, we are testing all the Building Blocks that have been developed in-house at AU. Building Blocks are the Blackboard name for extension tools – some examples of Building Blocks you’ll recognise are Turnitin and Panopto. A Building Block embeds third-party functionality into Blackboard, for example using Blackboard enrolments to control permissions, and making it easy to display content in a Blackboard module. However, there are other tools that you use every day, but you probably don’t even know have been created at AU. The scrolling banner and My Modules box are examples of these. We also have some tools that we as System Admins use and ordinary users will never see – things that allow us to deliver the NSS information to third year students or provide a Blackboard feed to ApAber. The testing process has involved documenting what each tool does and how it behaves now. We then use the same tool in our SaaS environment to check that it has the same outcome and behaves the same way. We make sure that all Building Blocks are tested in multiple browsers, as well as on PC and Apple. Where appropriate we’ll also test on a mobile device. And of course, we check in both English and Welsh. Once this has been done, we’ll pass feedback to our local developers for any changes that might be needed. And then the process starts again. We’re also getting used to the continuous deployment cycle that we talked about in the last blog post. This means making sure we receive the emails that come from Blackboard and read them closely to look at what’s changing for our environment. We may have fixes for problems we’ve reported or new / updated tools. Once the deployment has been installed, we then need to test each of the new items to make sure it does what we expect it to do as well as making sure that our bug has been fixed where appropriate. We may also need to update our documentation, FAQs etc to reflect the changes that will be made. If you’ve already read part one of this series, you’ll know how useful online polling services are to engaging students actively in the classroom (if you haven’t – take a look). how and where your data is kept. We found the Terms and Conditions of most services are fairly short and easy to understand – some even provided an ‘at a glance’ summary of main points. In the majority of cases, students are not required to create accounts or register for a service to take part in a polling activity. This means that for students, the only information that is collected about them would be details of the browser / device etc they used to access the poll. And this won’t be linked to their name or email address. In all cases, staff need to register with a service to create and display polls. For the majority of the services, you can either create a username and password, or link to an existing account (such as Google or Facebook). If you are using an existing account, be aware of the data that may be shared between the two services. Your Facebook or Google account will contain lots of information about you that you may not want to be shared. You may want to look at the settings for the connection to make sure that you are happy with the level of data shared. Have a look at the rights you have to your polls. Some services allow other users to browse and share presentations, so you may want to consider the visibility of your presentations. Consider which third parties your data is shared with. We strongly recommend that you choose a service where the data is either based in the EU or where the company has the EU-US Privacy Shield standard in place. And check your preferences – do you want to opt-out of mailing lists, advertising etc. At present, AU does not have a site licence for an online polling service, so when signing up for one of these services you are signing up as an individual, rather than as a representative of, or on behalf of, AU. In-class polling or voting is great way to increase student engagement and interactivity in the classroom (for example see: Shaw et al, 2015; Boyle and Nicol 2003; Habel and Stubbs, 2014; Stratling, 2015). It is used widely in both higher and further education, and number of staff at AU make use of in-class polling on a regular basis. In addition to physical Qwizdom handsets available in loan stock, staff are more and more using online polling services such as Poll Everywhere, Socrative and Mentimeter (amongst others). These services allow students to use their own devices (such as mobile phones, tablets and laptops) to take part in polls, give feedback, and ask questions. The E-learning Group can provide a wide range of information and support for anyone interested in using polling in their teaching. This ranges from advice on how to embed polling into your teaching practice successfully, to practical help on creating and using polls in the classroom. 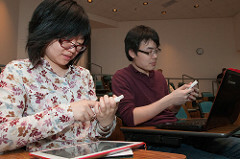 At present AU doesn’t offer a centrally supported online polling tool for mobile devices. However, there are a wide range of services available, many with free or trial versions. This blog post is designed to help you assess which tool suits you and your students’ best. What do you want to do? As with all learning technology implementation, the first question you need to ask is ‘what do I want my students to do?’ The service you select will depend on the answer you have. For example, if you want your students to submit questions, or provide written feedback, look for a service that offers more than multiple choice questions. How many students will be in the class? Many of the free or limited versions of paid-for software have a limit on the number of students they can be used it. Look carefully at the details of what the free version does or doesn’t include. The E-learning Group has produced some information on some services which you may want to look at. Think about your question/s. There’s lots of resources on designing good questions, particularly multiple choice questions. Don’t feel that you have to ask a question that has a correct or incorrect answer. Sometimes a question that sparks debate or shows the breadth of opinions on a subject can be useful. Practice. Have a practice before the session so that you are comfortable and familiar with using the questions and displaying the results. You can do this from your office using a mobile device such as a tablet or mobile phone. Make time in the lecture. If you are using polling activities in the classroom, make sure you leave enough time to give students to access on their devices, think about the answers and respond. You may also need time to correct misunderstandings or explain the answers. There are a whole range of opportunities for using polling – from collecting information on how much the students know at the start of a module, to finding out what topics you need to cover in a revision session. You can also collect opinions, gain feedback on how the lecture is going, or collect anonymous questions. If you’re using polling in your teaching get in touch and tell us more – we may even feature your work on the blog! 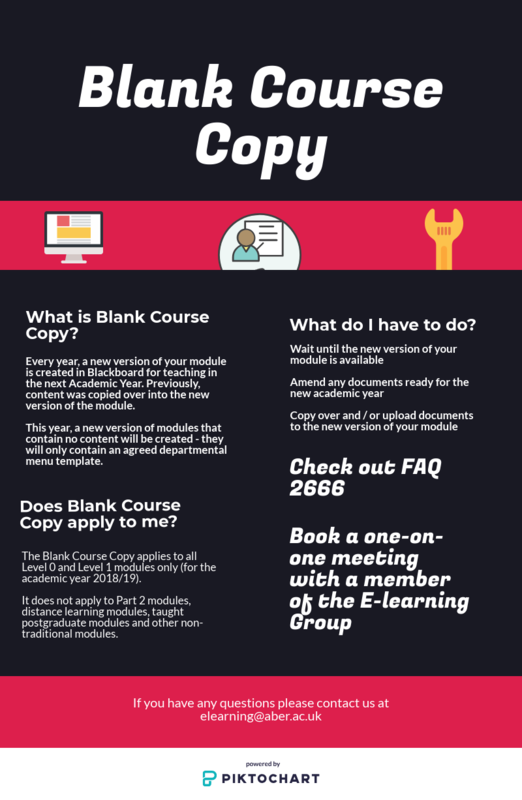 Today (30/07/2018) the first two departments had their blank level 0 and 1 modules created as part of the blank course copy process. IBERS, closely followed by International Politics, have agreed their departmental templates and their modules are now ready to be updated. This is nearly a quarter of all the level 1 and level 0 modules running in 2018-19 academic year. Staff from the E-learning Group have worked with each department to explain the process and help them decide which additional menu items to add to the core template. 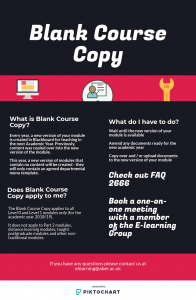 The modules are now available, and staff can start adding or copying over teaching materials. There’s an FAQ about how different items can be copied over. 2018-19 modules can be found on the 2018-19 Modules tab which is now available on the My Modules page. A big thanks to Mike Rose and James Vaughan who have worked with the E-learning Group through this process. If you’re a member of staff in either International Politics or IBERS and you want any help setting up your new module, take a look at the FAQ, or contact elearning@aber.ac.uk and we’d be happy to help you.